We are holding an exhibition that features the leading laser products, both from Japan and overseas, for the full range of scientific and industrial applications. Laser technology is expected to continually create new innovations, so many visitors come to this exhibition every year to see the latest laser products. By illustrating the full potential of the laser, it is possible to further strengthen the laser business and support the sustainable development of laser technology. This exhibition combines optical lenses with all the peripheral parts, designs, and manufacturing equipment to showcase the full range of optical lens products. Many industrial fields depend on optical technologies and there are increasing requirements for quality design and manufacturing equipment. Demand is growing, not only for mass-produced lenses, but also high added-value optical products. Companies that can meet these specification requirements are necessary in today’s growing market. At this exhibition, it is possible to understand the current optical lens design/manufacturing industry standards and connect them to your business. This exhibition brings together applied infrared and applied ultraviolet products and companies. Infrared products include optical parts, camera systems, etc. from the infrared region, and should attract an audience from industry and research centers. In addition, this exhibition also covers terahertz-wave and applied ultraviolet products. Processing equipment and analysis / measurement applications will be featured and the exhibition will support direct business matching. Cameras are attracting a lot of attention in the autonomous vehicle industry, but this is just one example of the changing role of cameras in the modern world. Industrial and FA cameras, robot / IoT / networked cameras, nursing care and monitoring cameras, surveillance cameras, and other specialized cameras for measurement, research and biomedical applications are continually improving. At the same time, spectroscopic measurement technology has made remarkable progress through the development of light sources, spectrum analysis, and information processing technology. As technology improves and becomes more cost-effective, Raman spectroscopic techniques are becoming more common for industrial use. However, until now, there has been no place to exchange information while looking over the entire range of industrial camera systems. Similar to the previously organized exhibition called “Vision Japan”, the Industrial Camera Expo was launched in 2017 by The Optronics Co., Ltd. to serve international companies that specialize in advanced camera systems. Now the 2019 Industrial Camera & Advanced Imaging Expo combines the full spectrum of industrial cameras with the latest software, processing, and network technology. 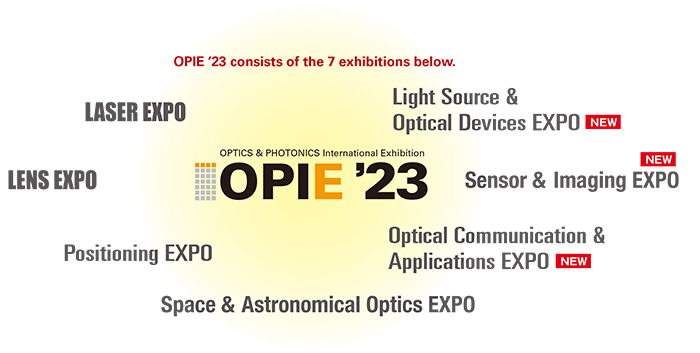 OPIE—Optics & Photonics International Exhibition is becoming the largest optics and photonics technology exhibition in Japan, and it is extremely synergistic to hold the Industrial Cameras & Advanced Imaging Expo in this setting. Optical technologies for space and astronomy are developing in a wide range and fast pace from basic to experimental use. These advanced systems require sophisticated components and software. This exhibition features the latest tools, parts, and equipment for engineers and researchers in the field of space and astronomical optics. Measurement and positioning systems requiring accuracies of micro- and nanoscale order. Optical metrology systems provide tools for scanning, measurement for manufacturing processes. Positioning equipment is often applied for biological research. These related tools are gathered together in a special exhibition. This is a good space to share product information with visitors, and also review and compare measurement / positioning systems with your business colleagues.